The energy from the sun pouring down on the earth is unimaginably large, inexhaustible, and free. Each year, the sun irradiates the earth with the same amount of energy contained within 19,000 billion tons of oil (toe). Just 9 billion toe would support the world's present energy needs. In other words, the sun gives us enough energy in just 20 minutes to power the world for one year. However, our exploitation of solar radiation is limited by clouds, seasonal daylight changes and the inevitable fall of darkness every night. Still, solar thermal provides a practically carbon-free, renewable alternative to the power created from fossil fuels. Technology has developed the use of solar energy for more than just sunbathing; direct channeling of the sun's radiation through solar collectors can be used for heating and cooling systems, and even for power generation. Solar thermal heating applications are the most commonly used form of solar energy in Canada. Domestic sales of thermal collectors accounted for an estimated avoidance of 60,297 tons of CO2 emissions in 2009. Studies show that more solar heating systems are being installed across Canada and B.C. in homes, businesses and public buildings, perhaps as a result of recent government incentives. British Columbia's optional Solar Hot Water Regulation requires suitable homes to be constructed with the future potential to have solar hot water systems installed, and Vancouver's Solar Homes Pilot and Green Homes Program will make the city's building code for low-rise residential construction the most comprehensive green building code in North America. In Canada, solar energy on the household, business, and institutional level seems to be the most attainable method of harnessing the renewable energy, as well as the type most readily embraced by governments and citizens. The idea of solar thermal power plants are appealing to supporters of renewable energies, yet the realities of their land and water demands often discourage development. Solar power operations use large and expensive equipment, as well as vast expanses of land and often enormous amounts of water for cooling the systems, making the use of solar energy both economically and environmentally questionable in some cases. Clearly, Canada does not feature the same climatic conditions that, say, Israel, the world's leader in solar thermal energy does. Can solar power plants still offer Canada a means to cut back on the use of nonrenewable? A range of solar thermal technology means there are more opportunities to draw upon its uses. For instance, solar thermal power plants may not be economically or environmentally appropriate in Canada, however, solar hot water and solar space heating in homes, businesses and institutions presents a proven way to tackle our emissions problem. Salvador, A. 2005. Energy: A historical perspective and 21st century forecast. The American Association of Petroleum Geologists. Tulsa, Oklahoma. pp 109-111. Solar thermal systems collect solar radiation for use in heating air and/ or water for domestic, commercial, or industrial purposes. Sometimes, they are used to produce steam, which then drives turbines to generate electricity. The principle of solar thermal energy can be used from the household level to the industrial level. What every solar thermal system has in common, is a solar collector. Collectors can be broken down by temperature, and by concentration. Low Temperature Collectors: These collectors produce low-grade heat (less than 110 degrees F) through the use of metallic or non-metallic absorbers. Suitable applications include: swimming pool heating, greenhouses, and low-grade water and space heating. Medium Temperature Collectors: These collectors produce medium-grade heat (greater than 110 degrees F, usually 140 degrees-180 degrees F) through the use of either glazed flat-plate collectors using air or liquid as the heat transfer instrument, or concentrator collectors. This type of solar thermal is mainly used in domestic hot water heating. High Temperature Collectors: These collectors are parabolic dish or trough collectors built to operate at temperatures of 180 degrees F or more. This type is primarily used by utilities and independent power producers to generate electricity for the grid. An array of parabolic troughs at the National Solar Energy Centre in Israel. Non-concentrating/stationary: In non-concentrators, the collector area is the same as the absorber area. Flat-plate collectors, the most used type, are often used in heating buildings. Evacuated Tube Collectors are also used. Concentrating : In concentrators, the area intercepting the solar radiation is larger than the absorber area. This is done with the use of concave reflecting surfaces that capture the sun's radiation and focus it into a smaller absorbing area. 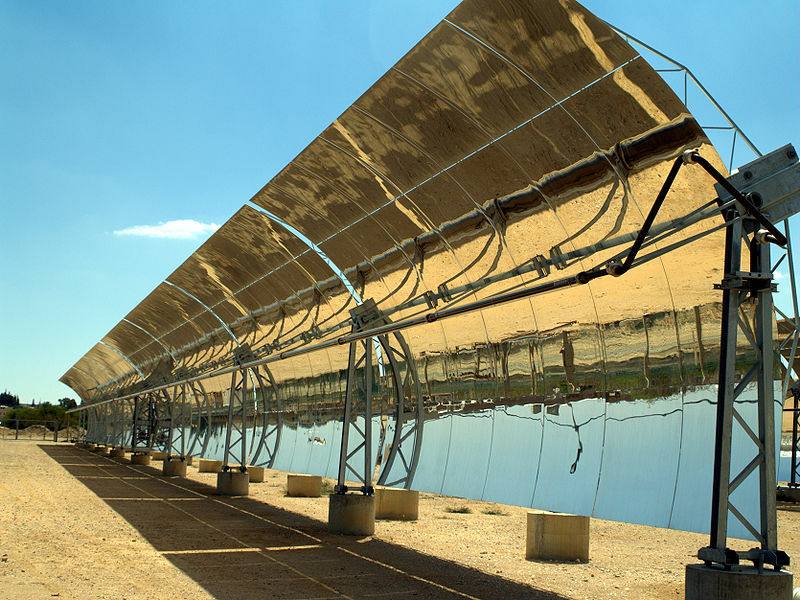 Concentrating collectors are typically high-temperature systems, and are the ones used by Solar Thermal Power Plants. Parabolic Trough Collector: Parabolic troughs gain their name from the parabolic (bowl-shaped) reflectors used to focus solar radiation onto receiver pipes located at the focus of the parabola. The collectors "track" the sun on a single axis (ie. N-S or E-W) tilting across the sky. This ensures continuous absorption throughout the day. Because of their parabolic shape, troughs can focus the sun 30 to 100 times its regular intensity, resulting in operating temperatures of over 750 °F (400 °C). A solar field consists of multiple rows of trough collectors positioned on a north-south, horizontal axis. A series of pipes transfer heated water to a central location where it is used to generate high-pressure, superheated steam. The steam is then used to turn a conventional steam turbine, which then creates electricity. Fluid is recirculated through the system to gather heat again and again. Parabolic Dish Reflector: This system comprises of a large parabolic dish (similar to a satellite dish) made of reflective material. These dishes track the sun, so that every second, the solar radiation is concentrated at the focal point of the dish. 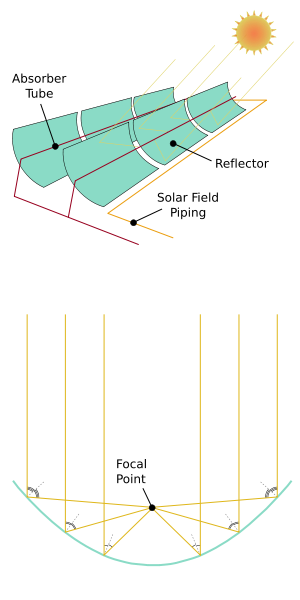 Due to this feature, a solar dish's concentration ratio is far higher than a solar trough's, with a working fluid temperature of up to 500 degrees F. Power generating machines may be hooked up to the dish itself, or else energy may be collected from a number of individual installations, and converted to electricity at a central location using steam generated turbines. Heliostat Field Collector : Heliostat power towers employ the use of thousands of tracking mirrors (heliostats) to collect the sun's thermal energy. In the centre of the "heliostat field" is a tower with a receiver at the very top. The mirrors target their reflected radiation onto the receiver, where it is transferred to working fluid, stored, and used later to generate power (heat —> steam —> turbines > electricity). These power plants can create temperatures of up to 2000°C. Solar thermal power plants use the sun's radiation to heat fluids and produce steam. The steam is converted into mechanical energy in a turbine, and into electricity by a conventional generator attached to the turbine. Liquid storage tanks called Thermal energy storage (TES) systems allow plants to bank hours of potential electricity. This comes in handy when the sun goes down, or when clouds come out, and is a big advantage over solar photovoltaic systems. Most types of power plants, from coal-fired to nuclear, generate power with steam driven turbines. The difference being that solar thermal power generation produces steam using the heat collected from sunlight, rather than from the combustion of fossil fuels. 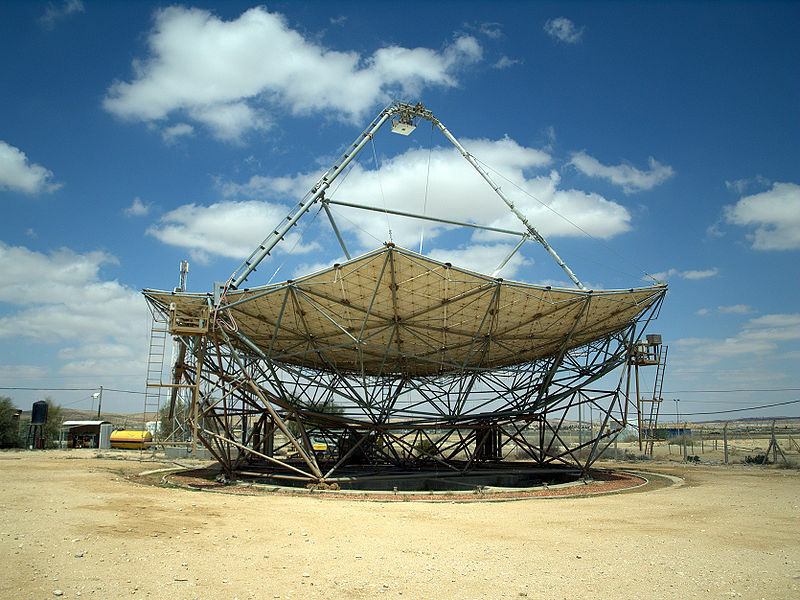 A solar dish at the Ben-Gurion National Solar Energy Centre in Israel. How does solar thermal heat the air in buildings? Solar space heating employs solar air panels to collect heat. These panels are either glazed or unglazed. Glazed collectors recirculate building air through a solar air panel where it is heated, then redirected into the building. Glazed collectors are used predominantly in homes. Unglazed collectors are seen at the larger scale commercial and industrial level. These larger systems use whole walls, or parts of walls, as the solar collectors. Heat is absorbed into "transpired solar panels", incorporated into the exterior of the wall, where it is stored until fed into the building's ventilation system. The main difference between glazed and unglazed, is that the former heats recirculated air, while the latter heats ambient (outside) air. How does solar thermal heat the water used for everyday living? Heating water with solar energy requires a sun-facing collector on a wall or rooftop. Solar radiation heats working fluid that is either pumped (active system) or directed by natural convection (passive system) through it. Heat is stored in a hot water storage tank that can be used when the sun has gone down, or when it is obstructed by clouds. Most systems have a back-up energy source that is activated when the water level in the tank drops below a certain point. Where can solar thermal on the household, business, or institutional scale be used? Solar collectors on the household, business, or institutional level can be used with varying degrees of success anywhere in the world. The more sunlight, the more effective the solar system will be at heating up air in rooms, or water for showers, pools, washing machines, etc. In these applications, collectors take up otherwise empty space on the rooftops of buildings. Ideally, collectors are unobstructed by overhanging branches, and kept clean to maximize heat absorbance. Where are solar thermal power plants ideally built? 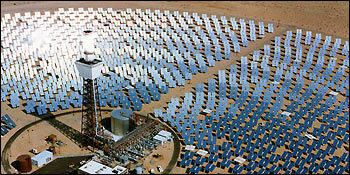 The most productive areas for solar thermal power plants are deserts. These cloudless regions are constantly bombarded with powerful radiation. The 's largest solar power plant, a grouping of systems called the SEGS, is located in the Mojave Desert, in the United States. Solar power plants require a substantial amount of clear space. You wouldn't place your home's solar collector in the garden, you'd place it on the roof. Likewise, solar thermal companies opt for open areas over crowded ones. 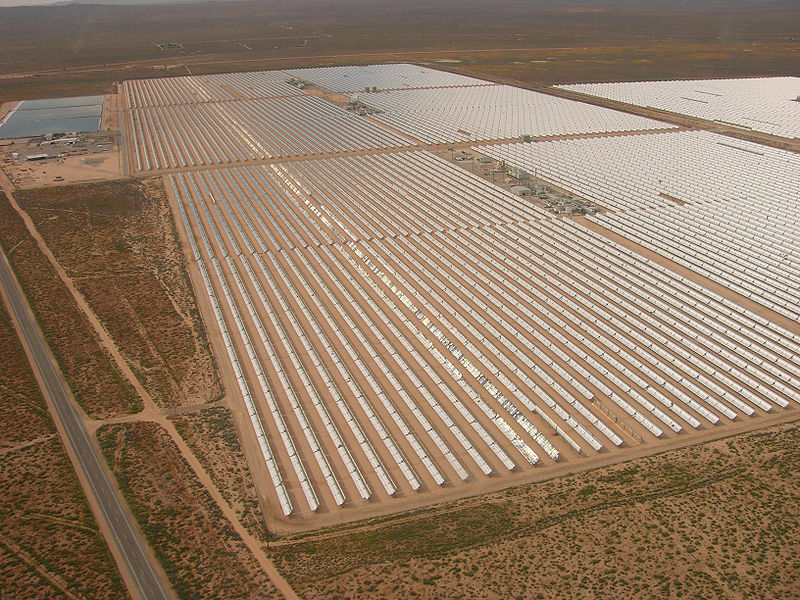 The openness of deserts lends itself nicely to the specifications of a solar power plant. Known as "solar fields", solar power plants cover the ground—often desert areas—with collectors, or reflectors that reflect radiation onto a central collector. Controversy over solar plants' excessive land requirements is further discussed in the Environment section. Solar domestic water heaters cost approximately $US 1000-3500 and the investment can break even after four to seven years depending upon whether it has replaced electric or gas heaters. Space heating systems can vary from inexpensive wall heaters ($800) to costly large central systems ($4000+). A 2010 energy law in Geneva, Switzerland, requires that at a minimum, 30% of a building's hot water demand be covered by a solar hot water heating system. Solar collectors can last anywhere from 15-40 years, leaving the system essentially void of cost while it operates. Each mirror in this field of heliostats reflects sunlight onto the receiver on the central tower. Solar power plants avoid the high and unpredictable costs of fuel, leaving their only main monetary investment the capital cost of installation. Minor operational and maintenance costs must also be considered. Average costs for plants under construction are between $ 122 /MWh and $220 /MWh, depending on location. Estimated future costs, as technologies gain further efficiency, might be as low as $42 - 61 per MWh for trough plants and $34-53 per MWh for tower plants. Statistics from the U.S. Department of Energy list solar thermal power costs around 13 to 17 cents per kilowatt/hour. Compared to wind, another alternative energy source, which produces kilowatt hours at 8 cents each, solar may seem less desirable. However, that's 8 cents per kilowatt when the wind is blowing. With solar, even if radiation is at a low due to cloud cover, stored solar heat energy can be captured and kept until needed. With solar thermal power plants, the biggest factor is location. In some areas, like Israel, solar can provide the most effective and cost-efficient option around. Studies say new plants under construction could, upon completion, produce energy at costs comparable to natural gas. CanmetEnergy, a branch of Natural Resources Canada, reported Canada's 2009 total revenue for the solar thermal industry to be $21.3 million. This number displays an increase of 13% from 2008 statistics. Ontario is the country's leading province, accounting for 53% of total solar revenue. Of 29 companies who responded to Canmet's 2009 survey, 25% recorded at least four full-time employees – a significant decrease from 2008's 40%. The total number of person-years of employment was reported as 157, or an average of over 5.6 employees per respondent (2008 reported 168). It should be noted that this survey was not designed to include results from those working at the retail sales and installer level, thus, true Canadian employment numbers are likely higher than this. Since 2008, revenue from domestic sales increased from $13.1 to $16.6 million, while revenue from export sales decreased from $5.7 to $4.8 million. Most exports were made to the U.S., with minimal exports to Europe and Central and South America. Most solar heating applications were supplied for residential use rather than industrial. Solar Energy Industries Association (SEIA). 2009. Solar Water Heating. Retrieved at: http://www.seia.org/galleries/pdf/factsheet_solar_water_heating.pdf. Glennon, Robert., Reeves, Andrew. 2010. Solar Energy's Cloudy Future. Arizona Journal of Environmental Law & Policy. Vol 1:1. Retreieved at: http://ajelp.com/documents/GlennonFinal.pdf. Canmet. Natural Resources Canada. 2010. Survey of Active Solar Thermal Collectors, Industry and Markets in Canada (2009). Science Applications International Corporation. Renewable Energy and Climate Change Program. Heating accounts for 70% of residential and commercial energy use in Canada. Predominant fuels contributing to that 70% include natural gas (used by 47% of Canadian households in 2007) and electricity (used by 37%). Bypassing our current predominant use of carbon-emitting resources by harnessing the power of the sun could shift the non-renewable and polluting energy content for heating needs in Canada. Equipment for solar systems is made from locally available, recyclable material such as glass, plastic, copper, aluminum, wood and steel. A 2009 Canmet report found that 60,297 tonnes of CO2 had been offset as the result of solar thermal collector sales in Canada. Their findings demonstrated a 21% increase from 2008. This signifies a clear impact of the solar thermal industry's growth on limiting greenhouse gas emissions in Canada, and highlights its potential to make much more of a contribution. Canmet also includes an estimate of the total green house gases avoided over the operating life of systems installed in 2009. These findings demonstrated a value of 269,305 tons of CO2 avoided over the lifetime of these systems (using a 20 year expected life for all water systems, and 30 for commercial air systems). And that's just for Canada. It's estimated that the solar collectors exported from Canada in 2009 will be responsible for avoiding a further 85,000 tons of CO2 during their operating lifetimes. Solar thermal power plants utilize vast amounts of land, and often, massive quantities of water — two factors that tarnish an otherwise environmentally progressive alternative energy. The Solar Energy Generating Systems (SEGS) in California's Mojave Desert, for instance, uses a sprawling 1,600 acres in order to put out their combined 354 MW. Some believe this amount of land could, and should, be used for housing subdivisions. Instead of a foundation for SEGS, the 1,600 acres could provide space for an estimated 6,400 homes. To produce 1,000 megawatts of power, a coal plant requires 640–1,280 acres of land, as does a nuclear plant; a natural gas combined-cycle plant requires at least 640 acres; but a concentrating solar thermal plant would require approximately 6,000 acres. Solar thermal power plant development finds itself caught in the tug of war between increased demands upon scarce land resources and shrinking energy supplies. Whether or not the landscape is dotted with solar energy generators will ultimately depend on a combination of pro-active government policies and which companies, i.e. housing or energy, win the property bids. One thing is for certain; larger populations mean more energy consumption, and the only way we're going to be able to support it sustainably, is with renewable energies like solar. Most concentrating collectors rely on water cooling, with the exception of dish systems which use air cooled engines. The most productive locations for solar power plants tend to be in hot desert areas where water supplies are limited — an unfortunate circumstance when most solar power plants require about 800 gallons of water per MWh generation. A plant in the Nevada desert is facing setbacks for approval of its system as it would use 20% of the available water in the region. Mounting water shortages have put pressure on power plants to switch to air cooling, which could eliminate upwards of 90% of water used. Shifting to this more environmentally rounded cooling method would impose cost increases of 2-10% on generating electricity, a move most companies are hesitant to make. The use of hybrid wet/dry coolers offers a middle ground: about 80% of water is saved, and companies suffer only a moderate profit cut. Both solar thermal and photovoltaics are dependent on — surprise! — sunlight. Climate conditions including cloud or fog, and seasonal changes in daylight have a large effect on the amount of solar energy absorbed on the earth's surface. Solar disc, design proposed by NASA. A possible scheme to surpass such challenges is to place large arrays of solar cells in satellites 30,000- 35,000 km above the earth. These solar system, solar cells would convert high radiation into electricity, which would then be fed to a microwave generation system for transmission to earth. The transmissions would be collected by receiving antenna systems and converted to alternating or direct current electricity. 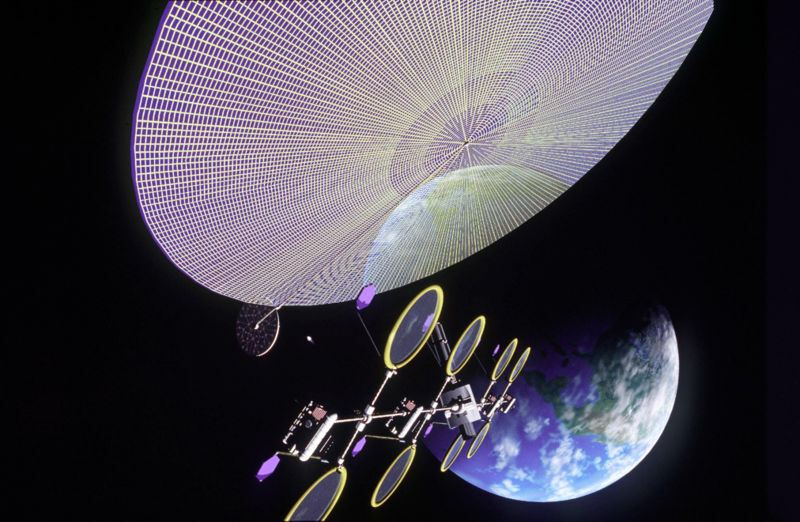 An equally futuristic proposal is to position large arrays of PV cells on the moon to transmit the solar power to earth via microwave beams. Neither idea has yet received any serious consideration. Lately, the province of BC has taken the first steps in following the lead set out by countries like Switzerland, Spain, Israel and Germany, who have implemented Solar Hot Water Regulations. Certain regulations in these countries require that new buildings, as well as those undergoing major refurbishment, utilize a percentage of solar thermal heating in place of conventional sources. 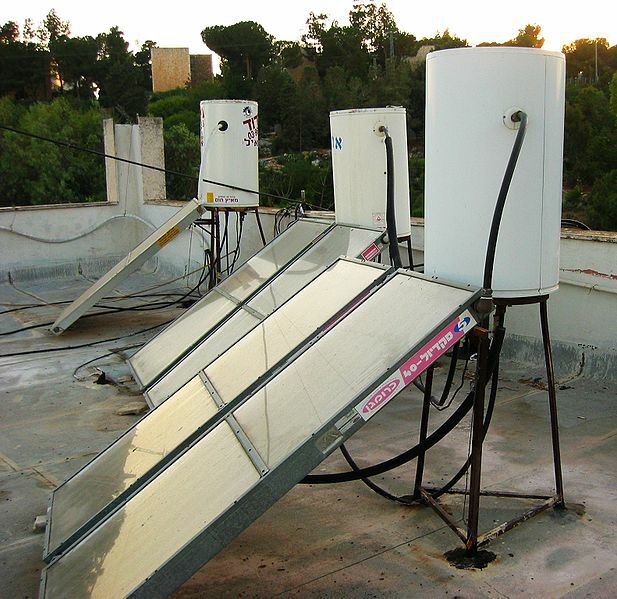 A solar hot water system on a rooftop in Jerusalem. British Columbia, in partnership with SolarBC, developed a Solar Hot Water Regulation bylaw requiring all new single family homes, where suitable, to be constructed with the future potential to install solar hot water systems. Local governments were invited to "opt-in" to the regulation. A list of communities who have already opted-in can be found here. The City of Vancouver has implemented a Solar Homes Pilot and Green Homes Program that together will make the Vancouver building code for low-rise residential construction the most comprehensive green building code in North America. The Green Homes Program requires that every new house feature a minimum of two 50mm pipes that run from the home's water tank to the attic, a component that will permit the future installation of roof-mounted solar energy equipment. Many communities wide are imposing solar hot water regulations, and demonstrating a global solar movement. Some examples are described below. Geneva: A 2010 energy law in Geneva, Switzerland, requires that at a minimum, 30% of a building's hot water demand be covered by a solar hot water heating system. The regulation applies to new buildings, as well as to extensions and roof renovations of existing ones. Barcelona: Since 2000, Barcelona, Spain, has required solar hot water systems on all new public and private buildings. It is the first city in Europe to impose such legislation. What countries use Solar Water Heating and Solar Space Heating? 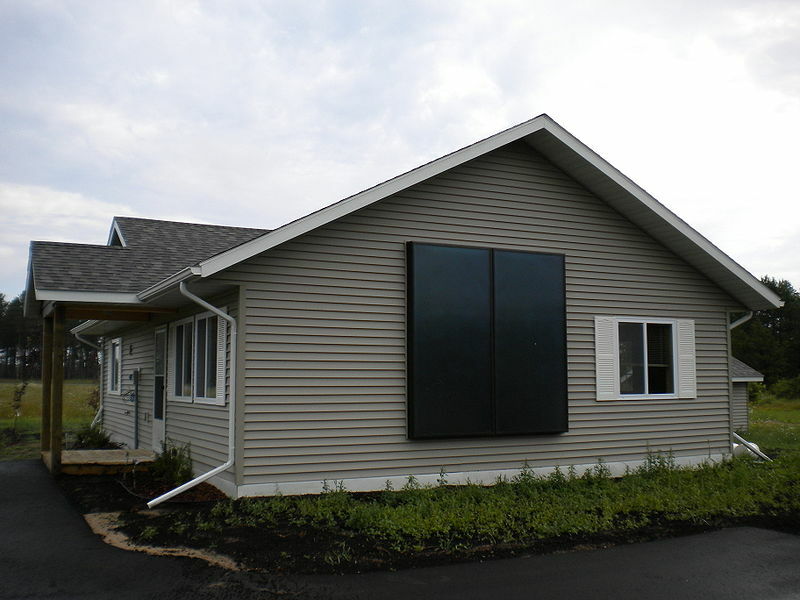 A solar air heat collector mounted on the side of a house. Technical improvements have enhanced performance and life-expectancy of solar water heating systems and solar space heating systems, leading to a massive rise in use. Systems are especially favourable in countries that enjoy an abundance of solar radiation, including Israel, Australia, China and Japan. Newer and more advanced systems boast better-than-ever efficiency during sunless hours than ever before, opening up the potential to regions with low to moderate levels of radiation. Still, most systems cannot provide 100% of a home's heating, but they can compensate for a percentage of 40-80% for water heating, and slightly more for space heating. Israel has worked hard to develop its solar thermal industry, and today is the leader in use of solar energy per capita. Solar hot water is used in over 90% of Israeli homes. Solar heating systems have also risen in popularity in China, where over 30 million households use solar to heat their water. Systems in these countries are far cheaper than those in Western countries (sometimes 80% cheaper). High installation costs are a major source of hesitancy in Canada. Other countries like Spain and Australia provide incentives and impose regulations that accelerate the use of solar thermal heating systems. Read more about these countries in the Solar Hot Water Regulations section. Where are the World's Solar Thermal Power Plants? The world's largest solar power generating, the Solar Energy Generating Systems (SEGS) captures the Mojave Desert's powerful radiation with concentrating solar thermal technologies. SEGS's energy output is 354 MW – about half your average coal-fired power plant, but enough to supply the demand of 500,000 people. Aerial view of the Solar Energy Generating System. Spain has erected numerous plants in the last decade alone. The country, with its abundant sun and minute rainfall, is a prime location for solar power development. The new La Florida plant bumped Spain's total output to 432MW, leaving the US (with 422MW) in second place. Spain has an average of 340 days of sunshine a year, and the promise of solar is expected to wean the country off its gas-fired and nuclear power stations, as well as its less reliable wind farms. But not all countries have the climate—or the supportive government policies—that Spain has. For some countries, getting projects from the proposal stage, to the power stage, is something of a challenge. It seems the idea of solar thermal power plants is often more supported than their reality. At present, many companies in the U.S. have announced upcoming projects that will usurp the SEGS's 20-year hegemony as the largest solar power plant in the world. These enterprises, like the Solana plant in Arizona, and the Ivanpah Solar Electricity Generating System also in the Mojave Desert, are still in approval and development stages. Lengthy permitting procedures in the U.S. and elsewhere deter many interested companies from following through with projects. For example, in 2009, Ausra, a California-based solar start-up, cancelled plans for its Carrizo Energy Solar Farm due to a constantly stalling permitting process. "This process does not allow for the kind of swift and definitive decision making that the business community needs in a world where the time-value of money is critical and where many solar companies are thinly capitalized," wrote the authors of a 2010 report. There has been discussion over the potential for countries like Spain to export their "surplus" solar energy through transmission lines to less radiant regions. No concrete plans or proposals have been made, and the logistics require further development. The main applications of solar energy technologies in Canada have been for active solar thermal applications in space heating, water heating and drying crops and lumber. There are an estimated 544,000 m2 of solar collectors operating in Canada, compared to 114 million m2 in China. They are primarily unglazed plastic collectors for pool heating (71%) and unglazed perforated solar air collectors for commercial building air heating (26%), creating about 627,000 GJ of energy and offsetting 38,000 tonnes of CO2 annually. These systems presently comprise a small fraction of Canada's energy use, but some government studies suggest they could make up as much as five per cent of the country's energy needs by the year 2025. Does Canada have any solar thermal power plants? Canada has no solar thermal power plants, and due to the high development costs and lack of incentives, businesses are hesitant to propose projects. Canada does, however, possess the world's largest photovoltaic solar power plant in Ontario, proving the richness of Canada's solar resources. Can Solar Thermal contribute to BC's energy supply? Yes. It can, and slowly is beginning to. SolarBC (2010) reports at least 540 residential solar hot water systems in BC and that number is expected to continue rising. Most British Columbians enjoy an average of 2,000 hours of sunshine per year, or almost six months of sunshine. Germany, one of the world's leading countries in solar hot water use, has only 1734 hours per year. BC's climate is just as suitable, if not more, as those that already support major solar thermal energy use. The difference lies in government policies. While countries like Germany have been active for years, Canada is only just starting to implement regulations that will accelerate the expansion of the solar thermal industry. Burgen, S. "Spain overtakes US with World's biggest solar power station." The Guardian. 2010. Accessed July 13, 2012. US Department of Energy. "Concentrating solar power commercial application study: Reducing water consumption of concentrating solar power electricity generation." Report to Congress. 2007. Accessed May 30, 2012.
International Energy Agency. 'Energy Technology and Perspectives.' 2008. Accessed May 30, 2012. Fairley, P. "Solar without the panels." Technology Review. Glennon, Robert., Reeves, Andrew. "Solar Energy's Cloudy Future." Arizona Journal of Environmental Law & Policy. Vol 1:1. 2010. Accessed May 30, 2012. Global Solar Thermal Energy Council. "Reduced water consumption in concentrating solar power systems." 2011. Accessed May 30, 2012. Solar BC. "Regulations and Government Policies. Why Solar?" 2008. Accessed May 30, 2012. C40 Cities Climate Leadership Group. "Renewables." Barcelona, Spain. 2010. Accessed May 15, 2012. US Energy Information Administration. "Solar Thermal Collector Manufacturing Activities: Overview." 2009. Accesed May 30, 2012. CHAMSOLAR. "Solar Thermal - Principle & How it works." 2011. Accesed May 30, 2012. Canmet. "Solar Thermal. Renewables." Natural Resources Canada. Accesed May 30, 2012. National Renewable Energy Laboratory. "Solar trough systems." 1998. Accesed May 30, 2012. Solar Energy Industries Association (SEIA). "Solar Water Heating.". 2009. Accesed May 30, 2012. Science Applications International Corporation. "Survey of Active Solar Thermal Collectors, Industry and Markets in Canada." Renewable Energy and Climate Change Program. Canmet. Natural Resources Canada. 2010. Accessed May 30, 2012.